If you want to give someone the stars, start with a top-rated pair of stargazing binoculars. Astronomy with binoculars is a wonderful hobby and much less expensive than investing in a heavy and awkwardly shaped telescope that would be difficult to take with you anywhere. 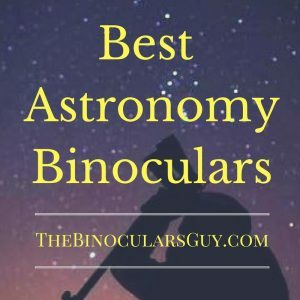 I will help you find the best binoculars for astronomy to ensure you get the most when looking at the stars and other planets. My detailed astronomy binocular reviews will cover the top rated pairs for the best stargazing experience, whether you are a beginner or experienced astronomer. I will highlight their individual features, how to get the best views with each model and who we recommend each brand for. This specific Astronomy Bins is the most popular with our readers. The main advantage of a handheld astronomy binoculars is that you can quickly and easily scan the sky for the star or planet your are looking for. Handheld binoculars are less steady than tripod-mounted ones, but with an image-stabilized binoculars the difference is much smaller. Typically these will have less magnification and a smaller objective size as the larger binoculars can be very tough to hold steady when looking at planets, comets and asteroids. Perfect for: Those stargazers who are after convenience, as these are perfect for pick-up-and-go. The main advantage these have over handheld models, is that they are far more stable. This means you can easily go for a bino with 25×70 or even larger, since the tripod will be keeping your bino stable for a much closer look at the celestial bodies. I would go so far as to say that you shouldn’t even consider getting a 15x-20x without a tripod. The magnification is simply too large to be held steady in your hands. If you are also in the market for the best binocular tripod for astronomy, I highly recommend the Vanguard Alta Pro 263 range. You do lose the ability to quickly scan the sky though, so keep that in mind. Perfect for: Those astronomers who want to get a really close look at a planet or comet, and who don’t mind taking the time to find their target. I just want to emphasize that there is no one binocular for stargazing that is perfect for everyone. You have seen that there are handheld and tripod mounted binos. My nr 1 pick when it comes to binoculars for astronomy, is the Canon 10×30 IS Ultra Compact Binoculars. These Canons provide the best binocular stargazing with a built in image stabilizer (IS). This feature virtually eliminates the blurriness that is common when scanning the night sky for a particular star cluster, galaxy or nebula. To use the IS push the button down. The image you are looking at will jerk slightly then freeze allowing you to observe the star with minimal fringing or haze around it. Having to engage a button preserves the batteries so that you don’t accidentally leave it on and run them down. Water Resistant Coating – Very handy in case you want to use these binoculars for other types of viewing like wildlife or for hunting and get caught in a rainstorm. Overall the Canon 10×30 Ultra Compac are atgreat buy around the $350 mark. You will see crystal clear images without blurring or haze around stars. Perfect For: Having the versatility of using these for more than stargazing makes them a great buy for the outdoorsy types who want a high quality, compact, lightweight and versatile astronomy binocular that is good for stargazing, hunting, birding and travel. If you are looking for large binoculars for astronomy, the Celestron 71454 Echelon 20×70 should be the first one you consider. I really like the fact that these high specification optics from Japan are assembled by hand in the USA. The Echelon was created specifically for astronomy and long range observation. 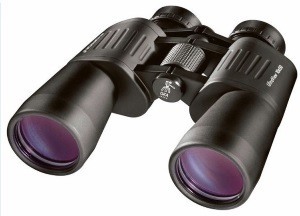 The large 70mm objective lens means this binocular will outperform most competitors in low light conditions. 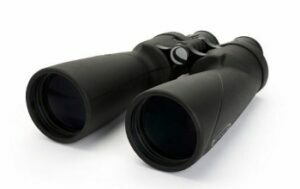 This top rated large astronomy binocular comes with a lightweight body manufactured from aluminium meaning you can also hold them in your hands when required. I do recommend getting a good tripod with these. I recommend the Celestron Echelon binos for serious astronomers who want to see the finer details of the astral bodies they are looking at. The Orion 9546 Resolux 15×70 Waterproof Astronomy Binoculars are for anyone who loves the idea of a telescope for stargazing but wants something less heavy, and awkward to move around. The Resolux binoculars are the answer. With high quality extra large BaK-4 prisms, exceptional multi-coatings and the tripod adapter for extended viewing these are a fantastic value for their normal selling price of under $400. The Orion name is synonymous with high quality, superior performance products and the Resolux is no exception. With the tripod adapter it easy to take these binoculars anywhere for extended viewing without the exhaustive set up and limited view of a telescope. Images will be sharp with minimal blurring at the outer edges of whatever you are viewing. This is one of the best stargazing binoculars for junior astronomers (tripod adapter is good for small hands and arms that will tire quickly holding them). They also offer an impressive 18mm eye relief for eyeglass wearers and can be held by hand for exceptional wide field viewing at night or day. I recommend the Orion 9546 Resolux 15×70 Waterproof Astronomy Binoculars for those just starting out with astronomy looking for a good astronomy binocular. Perfect For: Having the versatility of using these binocs for more than stargazing makes them a great buy for the outdoorsy types who want a high quality, compact, lightweight and versatile astronomy binocular that is good for stargazing, hunting, birding and travel. 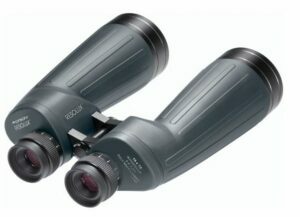 We highly recommend the Orion 0935 UltraView 10×50 Wide-Angle binoculars to beginners and long-time astronomy enthusiasts. These are one of the best astronomy binoculars for the money. At a price well below two hundred dollars, they are a great value packed with features and made with high quality materials. The BaK-4 prisms deliver crisp, sharp images even in low-light conditions thanks to the superior optics and lens coatings that allow for maximum light gathering, making them perfect for gazing at the Milky Way or the Northern Lights. Wide, and I do mean wide angle viewing. You can see way more of the night sky with these than with a telescope and there is virtually no distortion or haze around stars, even the really bright ones. Long, long eye relief for eyeglass wearers. The standard LER is around 13mm, better is around 15mm, but the Orions offer a whopping 22mm of eye relief. Rugged metal body, a wide neck strap, and rubber armored for a keeping a secure grip on them makes these ideal for junior astronomers who might be a little hard on them. They also have a threaded socket for a tripod adapter for smaller hands and arms that tire easily. If you want a very wide angle view astronomy binocular that is eyeglasses friendly, great for kids with exceptional image quality then give the Orion 09351 UltraView Wide-Angle Binoculars serious consideration. If you want to “see stars” without the large investment needed for a telescope, then astronomy binoculars are the way to go. Yes, you can actually use them to see the night sky in more depth and detail than you ever imagined. In fact, stargazing with binoculars offers advantages over using a telescope. They are much less expensive, for one. Binoculars are also a lot smaller and easier to carry around (camping, on vacation, etc). Finally, you can use them for other things besides astronomy like wildlife viewing, birdwatching or sporting events, too. When choosing the best pair of binoculars to see stars there are a few things you should know before you buy. Without getting so technical that your eyes start to cross and your head aches, this article will cover the most important information you need before you make your purchase. 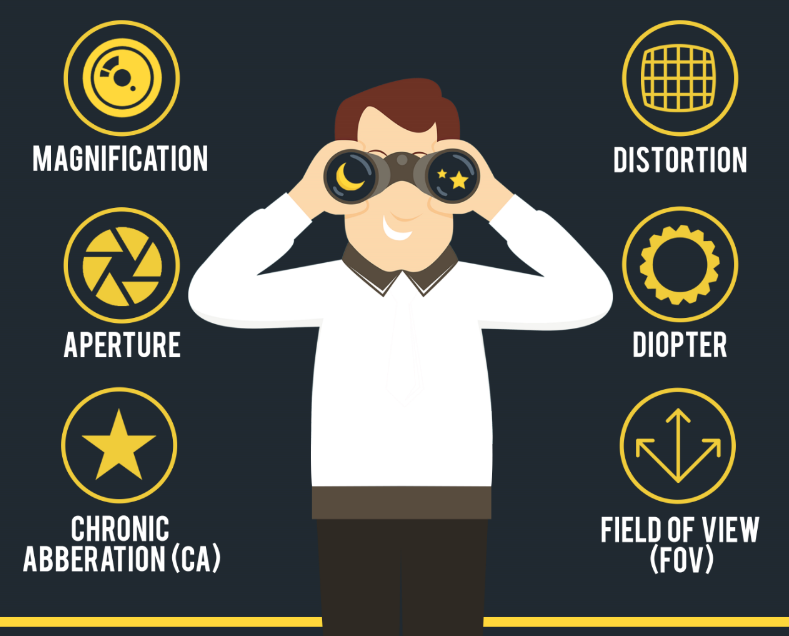 There are a lot of technical terms associated with astronomy binoculars that you might not be familiar with. To help you avoid feeling overwhelmed by the lingo here are a few terms you need to know and understand before you go shopping for binoculars for looking at stars. On the back of binoculars, you will see some numbers like 8×40 or 10×50. The first number is the magnification power of the lenses. The bigger the number, the larger objects will appear through them. Higher is not always best as the image you see may be blurry and dim. The lens quality and other factors should be considered, too. There is not a lot of difference between a 7x or a 10x except in the price. This term refers to the diameter of the large front lens (measured in millimeters) and is what will let light in through the lenses for the best viewing. So 10×50 means the lens is 50 millimeters in diameter and will let in more light than say 40 millimeters. More light means brighter, clearer images. This is very important feature offered by the Celestron SkyMaster Giant 15×70 binoculars with a 70mm diameter lens. This term refers to the widest dimensions you can see through the lenses. It is measured in feet at 1000 yards. So, FOV 1 is 52.2 feet by 1000 yards. The FOV is on the focus of the binoculars and to determine it multiply the degrees by 52.2 ( FOV is 5: 5 X 52.2 is 262.5 feet of viewing). You want a good FOV, but without sacrificing magnification so this is a matter of personal choice and testing different models to see what looks best to you. The Orion UltraView Wide-Angle binocular offer an exceptionally wide-angle view with minimal distortion, something important to consider when choosing binoculars for astronomy. Astronomy binoculars with a large FOV might have some blurring at the edges, also called distortion. A little around the edges is okay as it won’t affect your view of the stars much. When you look at objects with a strong contrast to their surroundings (dark tree limbs against a bright sky) any green or violet haziness around the fringes of the object are CA. This is not a problem for astronomy use, but will not be desirable when looking at landscapes or birds, for example. This means the binocular barrels are misaligned and not pointing in the same direction. This will strain your eyes and could make you feel slightly “seasick.” Reject any model of astronomy binocular with this problem. When you hold a pair of binoculars at arms length and look into the lenses there will be two circular points of light. These are the exit pupils, determined by the magnification and diameter of the front lens. These points of light should fit inside your pupils, Since not everyone pupils expand to the same diameter what size you need will vary. In general though, under 30 years old you want 7 X 35. Older eyes will need more like 7 X 50. This is a feature primarily for those who wear glasses. It means the distance from the surface of the eyepiece lens where you can still see the full field of view of the image you are looking at. It is difficult for many manufacturers to provide long eye relief and a wide field of view. 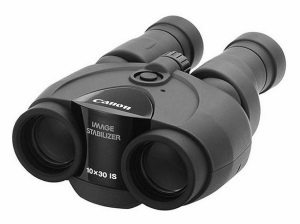 However the Canon 10×30 IS Ultra-Compact Binoculars are a superb model that provides both for eyeglass wearers or even those who just want to be able to use their binoculars with sunglasses sometimes. This is what allows us to see images through the lenses orientated correctly, not mirrored or reversed like you would see through a telescope. There are Porro Prisms, which are binoculars with a body shaped in the “classic design” and named for the optician who invented them. This is a remarkable upgrade to the best binoculars for astronomy that helps to “freeze” the image you are looking at and minimize blurriness. This is especially helpful for low light viewing like at the sky at night. Higher quality binoculars like the Canon 10X30s offer this particular high-end feature. This term means the measure of the lens’ optical power. A higher diopter or adjustable diopter allows you to fine tune focusing on objects. The Celestron SkyMaster Giant binoculars offer very smooth focusing even at a very wide angle. Now that you know the lingo and understand the different types, it is time to go shopping for astronomy binoculars for sale. If you decide to buy stargazing binoculars online, make sure to choose a retailer with a good return policy in case something goes wrong. Never buy any pair without a thorough inspection and ask about a refund if they don’t measure up when you take your first night view of the sky. Inspect the lenses first thing. The darker the reflection in them, the higher quality of the optical coating. If you see a white reflection that means the lens has no coating. Do not buy those. The terms “ruby coating” and “multi-coated” are just marketing terms and don’t indicate a better quality lens. When inspecting the lenses look at the exit pupils, They should be uniformly round and very bright, meaning higher quality prisms were used. The best prisms are made with BaK-4 glass. Sometimes manufacturers will use cheaper quality to lower the price. Look through the lenses. If you can’t merge the two images into one the optical alignment is off and you don’t want a pair with this problem. How do objects appear at the edges of your field of view? A little distortion in okay, but generally everything you see should be sharp. When you look up at a star it should not have rays or spikes radiating out from it. Finally, how heavy are the lenses? Will you be fatigued holding them up for long periods of time as you view the sky? A junior astronomer might be better off with an H body type binocular because they are more lightweight and compact. An adult or more “expert” stargazer may prefer the classic look and feel of a Porro prism style body, and can handle the extra bulk. Astronomy with binocs can literally give you the stars! Read our astronomy binocular reviews to find the best stargazing binoculars for you. Whether you want to be ready the next time Halley’s Comet makes his appearance, or you just want to enjoy looking at the planetary system, the binoculars for astronomy recommendations above will help you buy the right pair of binos. If you are interested in reading more about some of the top binoculars in huting and birding category, Dont forget to visit our homepage here.